Amy from http://feedproxy.google.com/~r/amyscreativeside/~3/OFBcv-xSpio/ is hosting another great festival for us!! Since we can enter two quilts, my second entry is this one...in the machine quilted category. I made 3 of these for my grandsons for Christmas last year. This one in the gold and black, one in blue and white, and one in mossy green. This quilt measures 74 x 94 and is machine quilted on my Baby Lock Tiara with Fil- Tec Glide thread top and bottom. I bought this pattern on line. Voting starts on Amy 22 nd....please vote, thank you. It is a great quilt , I bet your grandson loves it . This is such a cool quilt. 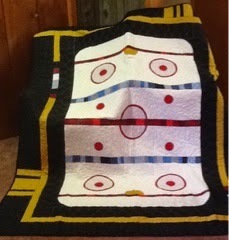 It does not matter if you are a hockey player, coach or fan; this is the quilt for you. Your grandsons are very lucky to have such a talented Grandma. Thanks for sharing during the Festival. This is such an awesome and fun quilt! Good luck in the Festival!